Your closet is one of the most critical tools in being as fashionable as possible. However, having order in your closet is important for both fashionistas and everyday dressers. 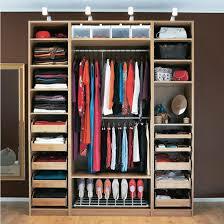 Check out these tips and see if your closet/wardrobe need an inventory. You can't wear what you can't see. You might not really be able to see every single thing in your wardrobe, but you can organize things in a way to trigger your memory about what you have. If you have a closet with a door, maybe leave it open, so you can catch the colors and styles you have hanging. You'll want your clothes to get as much air as possible anyways. Put things in your drawers you know you will frequently see, so they don't get buried there. This is a must! Not only does light help you see what you have, but it also allows you to see how things look when paired with other items. And, obviously no one wants to look like they got dressed in the dark. If your closet is small or doesn't have an overhead light fixture, consider tap lights. You can stick them to the side of the wall and illuminate your attire as needed. Put like things together. This will make planning outfits much easier. If you know where to look for certain things, you can find and pair them quicker. Also, it helps to have similar things together so you know when it's time to let them go. As you get more of one item, you'll be able to clearly see it's time to donate! 4. Know what to hang. Know what to fold. Some things must hang, while others don't have to. Obviously suits should always be hanging, as well as many other dressy and professional items. However, most cotton pieces can be folded. Being able to fold saves space and can also reduce the amount of ironing you might have to do in a rush if you fold optimally. Consider the material, size and shape of the items to determine if their best for hanging or folding. Your wardrobe will be better for it. Hopefully these tips are helpful, especially as summer winds down, and fall clothes come to mind.